By Matt Wellens on Mar 9, 2015 at 11:19 p.m. 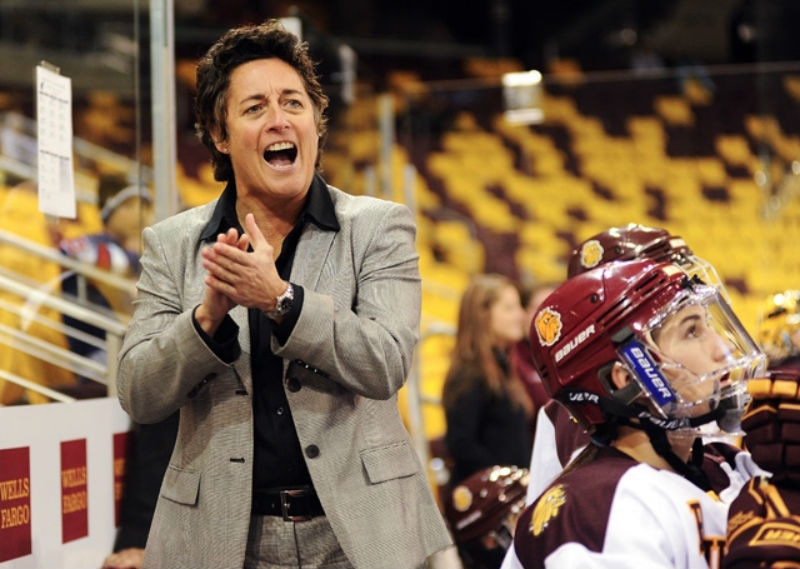 While Shannon Miller prepares to fight the University of Minnesota Duluth in court over the non-renewal of her contract, the Bulldogs’ athletic department has begun the process of moving on without her as head coach of the women’s hockey program. Less than 24 hours after UMD’s season officially ended — the Bulldogs were one of the last three teams left out of the NCAA tournament Sunday — the university launched its search for a new head coach on Monday by posting the position and holding a news conference inside the Hall of Fame room of the Sports and Health Center. That top job has a cloud of controversy surrounding it, however. Since the university announced on Dec. 15 that Miller’s contract would not be renewed beyond the 2014-15 season, the five-time national champion coach has accused the university of violating Title IX — the federal law that bars schools that receive federal money from discriminating based on gender. She also alleges the university has discriminated against her as a gay woman. She has hired lawyers that specialize in both areas. Current and former players, as well as supporters of the program, have been vocal about their displeasure with the university’s decision to jettison Miller after 16 seasons that included 383 wins, 10 NCAA Division I tournament appearances and seven Frozen Fours. Detractors of Miller point to the fact that she hasn’t won a national title since 2010, reached the NCAA tournament since 2011 and has gone 7-28-6 against the top teams in the WCHA —- Wisconsin, Minnesota and North Dakota — since the 2011-12 season. Meanwhile, the university has publicly altered its reasons for ousting Miller. In December, Berlo said it was strictly a financial decision, that the university could not afford Miller’s salary, which had grown to $207,000 this season. Last month after pressure from state senators and Gov. Mark Dayton, Chancellor Lendley Black cited the program’s recent decline, among other reasons. Despite how the last 12 weeks have played out captivating local, regional and national media attention, Berlo isn’t concerned about the controversy tainting the talent pool. “We’re an institution that is very committed to Title IX,” Berlo said. “In fact, our student-athlete population almost identically mirrors our student body population and we believe we provide a great experience for our male and our female student-athletes and I think you see that in the success a lot of our female teams have. Berlo announced a 10-member search advisory committee that consists of administrators, faculty, an area youth girls hockey coach, one former player and two current players. Eight of the 10 members are female. Abby Strong, UMD’s assistant athletic director of compliance and summer camps, will chair the committee that will work with Black, Berlo, Karen Stromme, an associate athletic director and senior women’s administrator, and NCAA faculty athletic representative Stephen Castleberry of the school of business. Strong said she will be working with the National Association of Women’s Collegiate Athletic Administrators, the American Hockey Coaches Association, Tucker Center at the University of Minnesota and Alliance of Women Coaches, and early indicators tell her there is a “significant amount of interest” in the UMD coaching vacancy. The qualifications listed by Berlo and in the official job posting include 3-5 years experience as a head or assistant coach at the Division I and III levels; experience recruiting female athletes in the United States and internationally; experience as a college athlete; and connections to national teams — something Berlo cited as very important. The posting will remain open for 30 days and Strong said the committee hopes to have a pool of finalists by mid-April. According to the job posting, the new coach will start June 15. Miller’s contract runs through June 30. Kim Riordan — UMD Associate Vice Chancellor and Associate Professor of Education; long-time women’s hockey season-ticket holder. Ashleigh Brykaliuk — Sophomore UMD forward; second-leading scorer in 2014-15 and top returning scorer for next season. Sidney Morin — Sophomore UMD defenseman; second-leading scorer among UMD defenseman and top returning scoring defenseman for next season. Leigh Neys — UMD Director of International Education Office; former Campus Athletic Committee member; former NCAA Division I volleyball player at Marist College. UMD begins search for new women’s hockey coach | Duluth News Tribune.